Analogue Media Technologies is almost the last remaining audio cassette loader and duplicator in North America! Since you are dealing directly with the manufacturer, there is a lot of flexibility to give you exactly the product you want. We can load any length of tape from 1 minute up to 120 minutes. 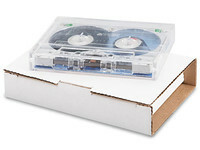 We also have a variety of clear, black, white, and colored cassette shells. We can also obtain special colours and tints. See our list of available C-Zeros by clicking here. 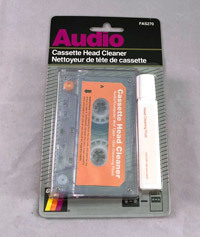 You will also find here a variety of packaging supplies and retail-packaged cassettes. Random Blank Loaded Cassettes! 25 Packs! Some extra cassettes we had lying around! Made into 25 packs, random colors and lengths, normal bias tape. Some extra cassettes we had lying around! 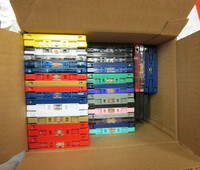 Made into 20 packs, random colors and lengths, mostly shorter tapes up to 30 or 40 minutes. 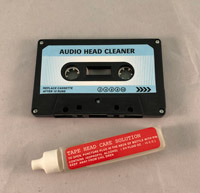 Various rejected audio cassettes, perfect for your art projects, decoration, or crafts. Hub locks prevent your cassettes from getting slack in shipping. Pack of 100. 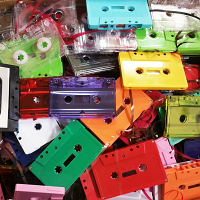 50 pieces of normal bias tape loaded into various coloured cassette shells. 50 pieces of 40 minute normal bias tape loaded into various coloured cassette shells. 50 minutes of premium Super Ferro music grade tape loaded into the florescent orange audio cassette. These glow under black lights! 10 pieces of 60 minute normal bias tape loaded into various coloured cassette shells. 50 pieces of 60 minute normal bias tape loaded into various coloured cassette shells. 10 pieces of 90 minute normal bias tape loaded into various coloured cassette shells. 50 pieces of 90 minute normal bias tape loaded into various coloured cassette shells.